If you’re like us, you’re loving the cherry harvest . . . but also your fingers are stained red and you’ve already maxed out on cherry pie. Well, if you’re also like us, you’ll cope by inventing a new cocktail. And by that, we mean stealing this idea from Aria Ristorante. You could, of course, just go there and have them mix this for you. But it isn’t difficult, we promise. 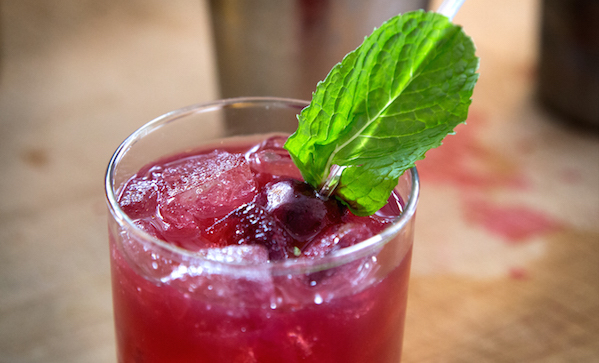 If you’d like a sweeter drink, skip the bitters and add a splash of Montenegro Amaro. Muddle the cherries in shaker. Add Cerasus Nonino, vanilla simple syrup, and bitters, and stir. Strain into a rocks glass. Garnish with a cherry.